Tomorrow, Monday, November 30th at 8pm, the Morbid Anatomy Museum is screening the documentary Chuy, The Wolf Man, a story about the life of Jesus 'Chuy' Aceves and his family, all of whom suffer from congenital hypertrichosis, or excessive face and body hair. "No-one's really sure what causes hypertrichosis, or how to cure it. What they do know is that there are about 50 documented cases in human history and it was my fate to be one of them," says Aceves. "We are the hairiest family of our species." 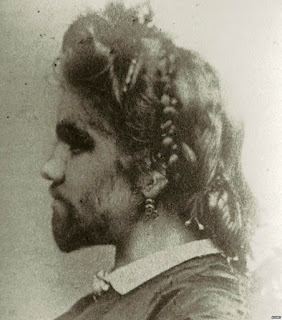 The earliest recorded case of hypertrichosis is Petrus Gonsalvus who was born in 1537 in Tenerife. He was exhibited at royal courts in Europe with his children who also had hypertrichosis. Jesus and his family suffer discrimination in all areas of their lives: the children are made fun of at school and abandoned by their 'non-hairy' parents, and the adults cannot find work unless they choose to exhibit themselves as freaks in circuses. This documentary examines the family's day-to-day lives and their struggle to find love, acceptance and employment. You can read more about the struggles of Jesus and his extended family in this recent BBC article.